I love all shapes of Christmas trees, don’t you? OK. 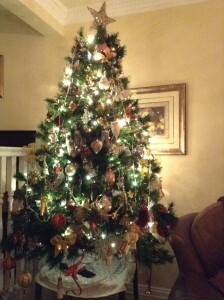 Hands up how many of you put your Christmas tree up last weekend so that you were ready for the 1st December? I know so many people do. Yet did you know that traditionally the ‘tree’ was decorated on Christmas Eve, and it was only in the late 1960’s that this changed. My own children would beg to have their tree decorated early to compete with their friends, but I always held out until a couple of weekends before Christmas Day. Putting up the tree and Holly felt so much more exciting if it was nearer the actual date. But that was then, and this is now – and to appease and have fun with my grandchildren we shall be ‘lighting up’ with the best, and the rest! I do love it all and have no objections whatsoever, its just that if I’m honest a teeny bit of me senses an inner rebellion against conforming to pressure. Then alongside that is a recognition of my own judgement against the continual rise of over-indulgence in society. But the Christmas tree is such a magnificent symbol of Christmas isn’t it? The Norwegian Spruce donated and erected in Trafalgar Square, in London, each year as a token of gratitude and appreciation for liberating Norway during the Second World War, always fills me with joy. As I turn off my lamps and sit with the lights of my own tree late in the evenings, when the house is quiet, I can always feel a sense of Christmas peace, hope and trust in the power of the presence of God and the angels. For me the joy is represented by all the tree-lights twinkling, reminding me of stars, Bethlehem, the Nativity story and the true message of Christmas brought by the angel Gabriel. For me, as an Essene, angels and trees go together. Trees are believed to be more than ‘plant’ life to the Essenes. Understanding that the roots of the tree going deep down into the nurturing and supportive earth (our Earthly Mother ) match as a mirror image the boughs and branches which reach out into the air and upwards to heaven (our Heavenly Father) reflects in their teachings. To the Essenes the roots represent seven angels of elements of the Earth itself and our physical life and bodies. The branches represent the seven angels of the Heavenly realms and our spiritual life, and the soul. The cyclical life of a tree with its growth, strength, rising sap and ability to produce the air we breath is highly regarded by the Essene, who consider the tree our brother, and the air the most valued of elements. 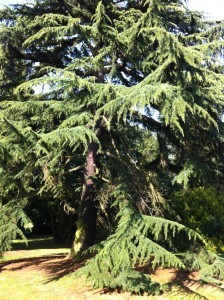 Trees have so many properties, medicinal as well as practical. The aura of a tree is far easier to see than that of a human being as it reaches up in all its magnificence into the sky. Trees, as living breathing organisms have an energy which to many is healing; a unique essence which can be used to re-balance our own emotions; an ability to offer communication and wisdom to those who are able to ‘tune in ‘ and hear. 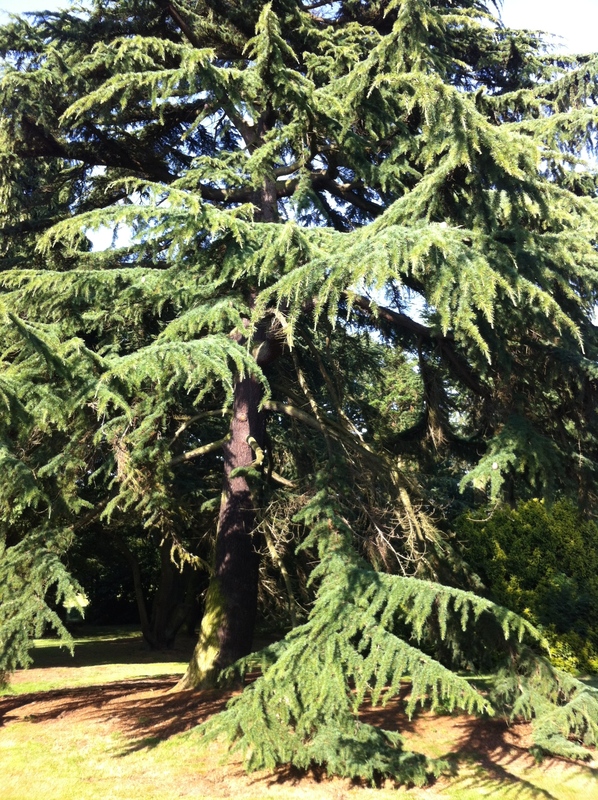 Once, not long ago, a group of us (at a Summer Gathering of Essenes) decided to offer healing to the magnificent ancient Cedar of Lebanon tree (circa 1800s) in the grounds of our residence in Berkshire. We had been experiencing the driest Spring and Summer on record and the tree was parched and clearly suffering from lack of moisture. We stood in a large circle and called in unison, “Hail to thee, Oh good living tree, made by the Creator” three times (taken from the Essene communion with the Angel of Life) . Then, all together calling in the angels, we held up our hands towards the beautiful Cedar and offered healing energy to her/him/it. The heat flowed through my hands and I felt a shudder running through my body. I felt emotional and sensed a powerful sense of love for the heart and soul of the beautiful tree. We ended by chanting three ‘Aums’ and as I walked away I felt a slight drizzle on my face and arms. I thought it had started to rain and looked about to see a reaction from the others. I actually thought we had magically created some rain! No, it was not raining. The moisture on my skin had the fragrance of pine needles. The tree had ‘showered’ me with her essence which I do believe was in acknowledgement of the healing it had received from us all, and me as the facilitator. As you decorate your Christmas tree this year, whether real or imitation, may I make this suggestion? How about lighting a candle before you start, call in the angels, and saying a little prayer as you hang your baubles and fix the lights bring blessings and gratitude into the task. Think of the tree as bringing hope and beauty into your home, and in return give it love and appreciation . With every tree we see this month on the lead up to Christmas lets shower it with loving glances and blessings, bringing the message and true essence of hope as we pass by. Remember that all loving energy of Light lingers where it has been created. Imagine the brightness we can co-create together, with or without thousands of light-bulbs!